Wow, what a ride it has been. I was able to talk from this point of view, since that was exactly me! The more I learned about NSX, and the more I looked for information, the more resources I found from amazing people who give a lot back for free. I'm also very proud to have been selected vExpertNSX in 2016. This was because I shared my enthusiasm for NSX with my VMUG, participated in SocialLabs, vBrownBag and the large latin community. There are many, many, many others that are ahead, technically, over me - this has always been the case in many things - but I decided that I would do my part in letting people know this is the next big thing. If anything, what I want people to feel is a sense of excitement of what's possible, that wasn't possible before! 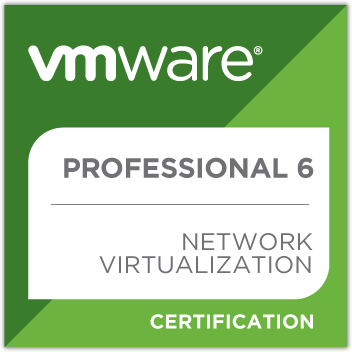 I decided my first big milestone would be getting the VCP6-NV certification. You may remember from this post that the VCP6.2 NV beta dates coincided with Elver Sena's book release during VMworld (where I actually met him, and got my signed copy!). Meeting Elver was super cool (we got an interview in Spanish done), and having his book, plus the accessible cost of the exam, made me take the plunge, and I got the happy news today that I passed! I wholeheartedly recommend getting the premium edition from Pearson, as those 4 practice exams have lots of questions that I feel helped me a lot! I think there is a lot more to come for NSX, much more than what we have already seen. I highlighted it is a unique product that offers capabilities no other product can match, especially in security. Likewise, it requires some skills, and busting silos inside companies. I even have some ideas for what will come in the future, when NSX will simply be able to handle all IT assets in the company, starting with IPAM. I know now its next step is that it will be able to handle all IT assets, being the one glue for real visibility and automation, on premises and in the cloud. My next milestone> I'm looking forward to more experience with NSX (vExperts have both NSX and vRealize Network Insight licenses for homelab use, while vExpertNSX's have had it for a little more time than that) and taking on the VCAP6-NV exam. I already have some great vCommunity resources lined up from Gabriel Maciel and Clinton Prentice and Iwan Hoogendoorn. I just wish I had some real networking switches to play with, but I hear Tim Davis, the official Face of #vExpertNSX, may find some cheap for my homelab - and with a little work, we can make some cool blog posts! If anything in this blog post, I want you to Get excited about NSX, and do something about it. Go for that first cert, push for a POC or some licenses in your company, and play with it. Dive deep. I guarantee you that it is time well spent, and may I hear about your success soon! PD, if anyone is still thinking you can't download NSX, I would like to remind you that you can; because it's the only supported upgrade of VCNS, almost all paying customers can access the bits, and this has been the case since NSX 6.2.3. The documentation is public, you can play all day in the HOLs, and everything you need to "hop on" is available. VMware's Wade Holmes (VCDX #15) just released a NSX micro-segmentation book in time for the RSA conference. In about 70 pages he focuses on day 1 concepts and considerations. This is incredibly valuable, since the majority of companies begin their NSX journey by first adopting micro-segmentation. I will read this soon and provide a more in-depth commentary on the book; I am also planning a install series with more of a concept and mindset, and how to work with the networking/server/security teams overall.